My utilities run around $400 per month, so I pay out around $1500 per month for my housing expenses. This may not seem like much to most people, but it’s a significant portion of my spending. I looked into purchasing a home recently, mostly for an investment, but it doesn’t make much sense financially right now. I can find a few houses in my neighborhood that need to be renovated with asking prices around 160-175k and having post-renovation values of 200-225k. My mortgage with taxes and insurance would be around $1050 per month on a 30 year fixed mortgage, and about $1350 per month on a 15 year fixed mortgage. This would require me to save around 4% down and have closing cost money. Since I’m still trying to pay off my last debt , I just don’t have any room to save that money right now or have any extra to throw at renovations. A home, when it’s time, will be a great addition to my net worth, especially if I go for the project home and get moving at fixing it up. Between the time of writing this and posting, MMM's latest post is an interview with Zeona McIntyre about her experience using airbnb for extra income. I often wonder if this is a route I could pursue to get some extra income. It's a great interview and worth the read. Check it out and let me know your thoughts about renting space in my home. Work has been insane these past couple weeks. I’m in the middle of transferring from prototype stage to customer demo/functional prototype stage and the demo has been accelerated by the customers limited calendar availability. To make it more of a challenge, more components were needed, which changes the design significantly. The only thing CONSTANT in Engineering is CHANGE! I’ve been in work mode day and night and haven’t had a chance to write. Since my last post, debt-vs-saving-vs-investing , I have decided to do what I talked about. I temporarily stopped my IRA contribution (missing out on the company match). I stopped my stock purchasing. I stopped contributing to my savings accounts. I transferred $600 at one point to my loan, and then another $400 a couple days after that. My balance is now, as of today, $4023.28. I now have a visual chart (spreadsheet) on my fridge as a constant reminder of making this goal. It has 5000 boxes to be filled in and I’m using a bright green highlighter to mark off the boxes as I pay down the loan. It’s working. It’s slow going, but it’s working. 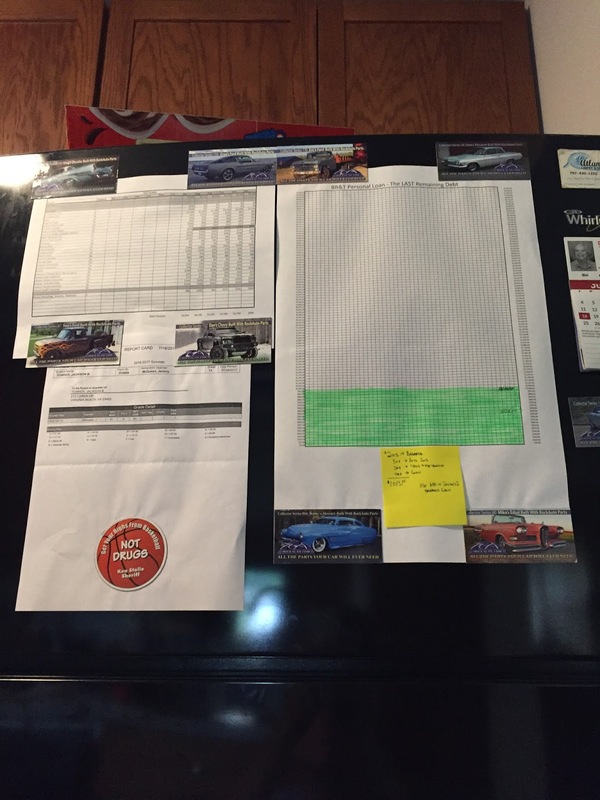 My yearly budget (spreadsheet with columns of months) is also now on the fridge in wide open view, for all to see. I always kept my finances private in my home life, but I figured if I’m posting most of my financial life publicly here, I might as well open up a little in my personal life. Here’s to continued progress!